Lunar Eclipse: What Are They? A lunar eclipse occurs when the Moon passes directly behind Earth and into its shadow. This can occur only when the Sun, Earth, and Moon are exactly or very closely aligned with Earth between the other two. A lunar eclipse can occur only on the night of a full moon. A total lunar eclipse can happen only when the sun, Earth, and moon are perfectly lined up — anything less than perfection creates a partial lunar eclipse or no eclipse at all. Because the moon’s orbit around Earth lies in a slightly different plane than Earth’s orbit around the sun, perfect alignment for an eclipse doesn’t occur at every full moon. 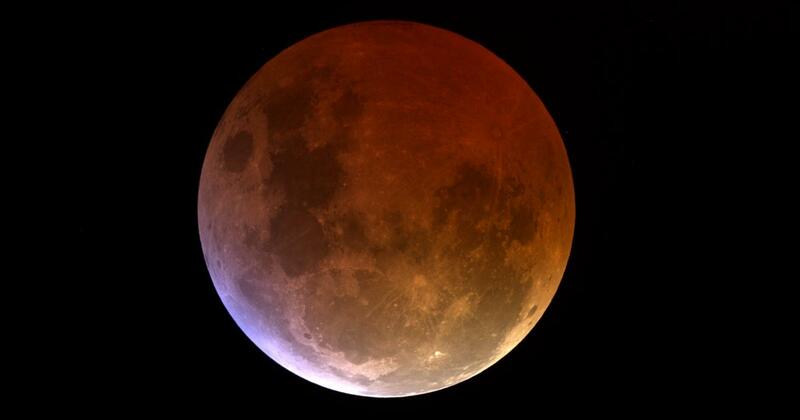 A total lunar eclipse develops over time, typically a couple hours for the whole event. Earth’s shadow can be divided into two distinctive parts: the umbra and penumbra. Earth totally occludes direct solar radiation within the umbra, the central region of the shadow. However, since the Sun’s diameter appears about one-quarter of Earth’s in the lunar sky, the planet only partially blocks direct sunlight within the penumbra, the outer portion of the shadow. Earth’s full (umbral) shadow falls on the moon. The moon won’t completely disappear, but it will be cast in an eerie darkness that makes it easy to miss if you were not looking for the eclipse. A partial lunar eclipse occurs when only a portion of the Moon enters Earth’s umbra. A penumbral lunar eclipse occurs when the Moon passes through Earth’s penumbra. The penumbra causes a subtle dimming of the lunar surface. A selenelion occurs when both the Sun and an eclipsed Moon can be observed at the same time. This can occur only just before sunset or just after sunrise when both bodies will appear just above the horizon at nearly opposite points in the sky. This arrangement has led to the phenomenon being also called a horizontal eclipse.